Potpourri can be made from fresh flowers and can be especially meaningful if the flowers were from something that touched your heart. Just let the flowers dry for several days and then place in a pretty bowl, maybe a crystal bowl. If you have a bowl that you really like, maybe one that was your mother’s or your grandmother’s, then that is perfect for displaying your potpourri in a doubly meaningful way. 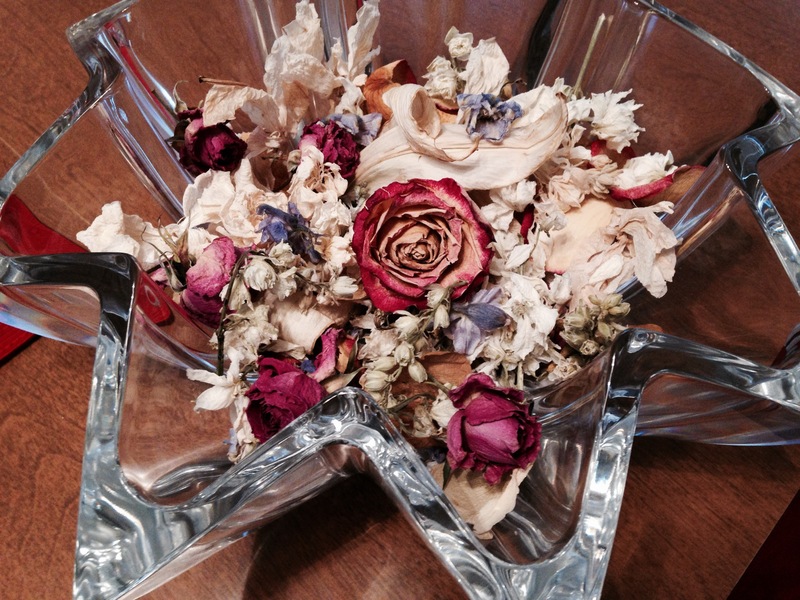 The dried flowers pictured below are special to me, given to us when I lost my husband. The bowl is special, too, given to me by my son-in-law’s mother on my 50th birthday. So when I look at this, I remember my husband. I remember my surprise 50th birthday party which was such a happy time, and the flowers remind me of all the love and support that was shown to me when I lost my husband. Lots of sweet memories!